Deepika Padukone serenaded us as we drove into Hassan, the upbeat songs of Bollywood hit movie Chennai Express playing on the DVD player in our van. Though a fan of Bollywood, I find this blockbuster hit to be grating (see my review here), but I have to admit it was getting a glimpse of a film-version of the south as we were driving through the reality. Also, I’ve loved Deepika since Om Shanti Om, a much more enjoyable Shahrukh Khan film. I suggest checking either film out if you ever have over 3 hours to spare. This unassuming budget hotel was trusted by our driver as a good quick stop for lunch. They proved him right with an incredibly cheap, but delicious meal. 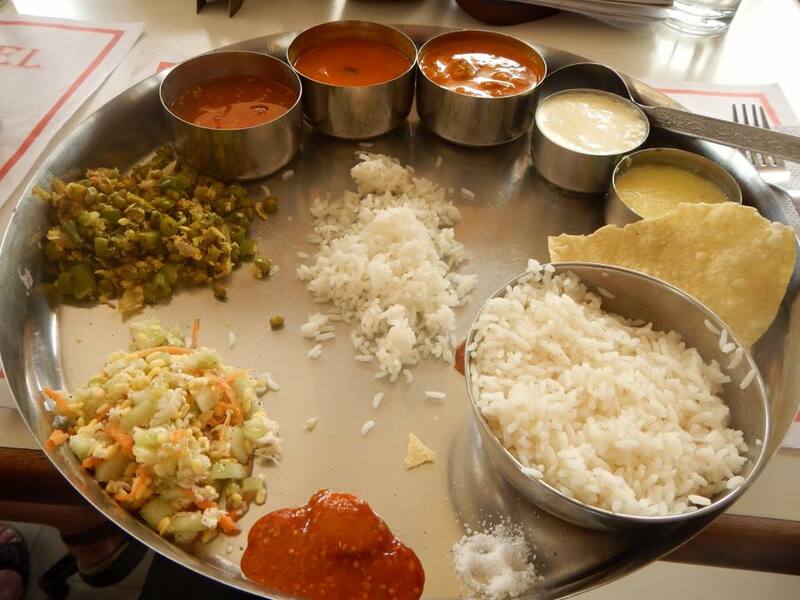 We each had a Thaali – a large silver dish with many small bowls of food that make up a complete meal. It’s like a buffet on a plate. As usual, you choose between the veg and non-veg. I believe I had the non-veg and enjoyed; but as usual, I suggest you make an educated decision about choosing the meat option based on where you are located. The waiters and a few other patrons hovered and starred, but for 35 Rs a thaali (as in 60 cents!!!) how could you possibly go wrong? 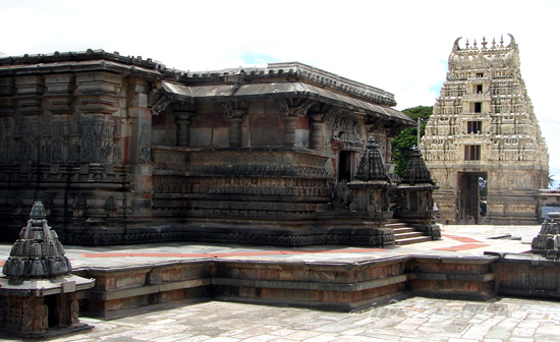 This temple built around 1120 CE is carved from a dark grey soapstone. Stepping inside where it’s dark and cool, you feel its age. For me, it was one of the moments when I was emotionally impacted by the amount of work and artistry that went into every inch of it, and the thought of generations of visitors who had been there before me. The outside is just as impressive, with entire battles being described in carvings around the temple. One tier even has a line of carved elephants being ridden by soldiers. Another by soldiers on fearsome rhino-like creature. But don’t touch! The soapstone is extremely soft – don’t be the jerk who leaves a mark. These types of temples are emblematic of the Hoysala Empire, which ruled the area between the 10th and 14th centuries and contributed significantly to the area’s arts and architecture. 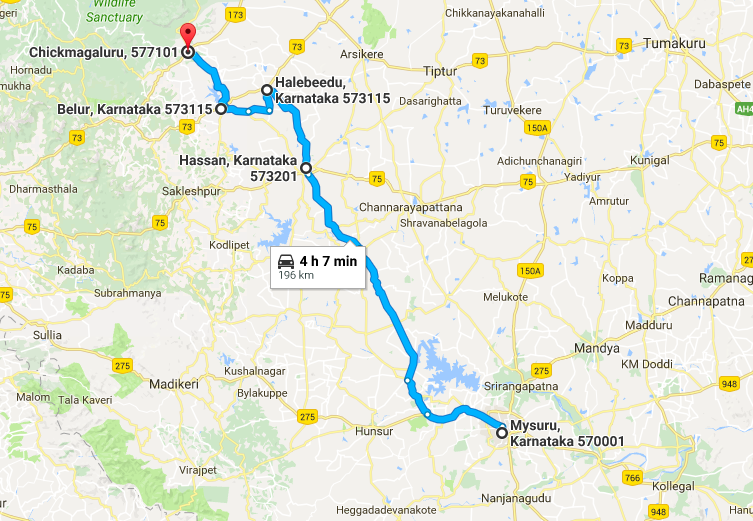 The name Hoysala has more of an origin legend, than an origin story. ‘Hoy’, which means ‘strike’, may come from the story of a young man-turned warrior who saved his guru (or teacher) by striking a lion dead outside a temple. 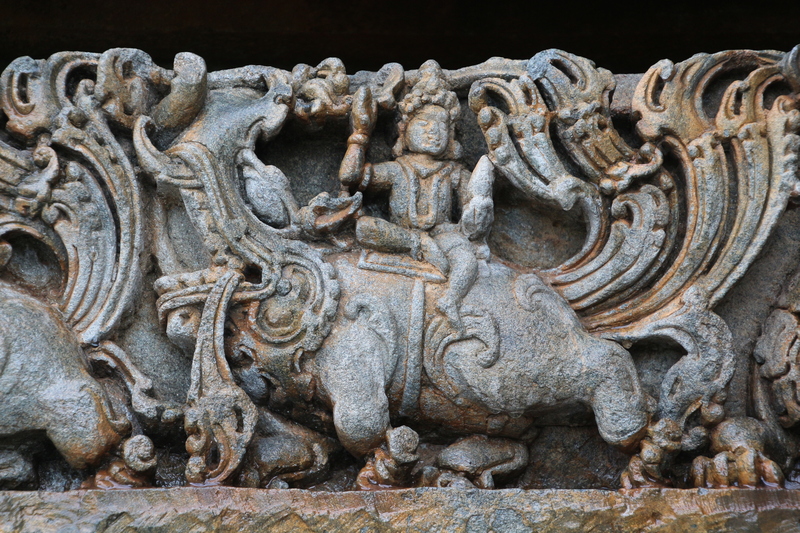 Historians don’t think it’s a coincidence that this story closely matches the empire’s emblem of the warrior Sala striking a tiger, the symbolic animal of the Cholas, an army defeated by King Vishnuvardhana. Also of note are the Jain influences on Hoysala society, another fascinating South Asian religion, which deserves its own post. Some scholars believe King Vishnuvardhana VIII commissioned the temple to surpass his overlord, King Vikramaditya VI of the Western Chalukya Empire (who ruled from Basavakalyan), after his initial military victories against the Chalukyas According to another theory, Vishnuvardhana was celebrating his famous victory against the Chola dynasty of Tamil country in the battle of Talakad (1116 AD). Within the complex, the Chennakesava temple is at the centre, facing east, and is flanked by the Kappe Channigraya temple on its right, and a small Sowmyanayaki (form of the goddess Lakshmi) temple set slightly back. On its left, also set slightly back is the Ranganayaki temple. Our guides took us a ghat (a series of steps that lead to a river, often a holy river) to show us a different side of the region. Approaching the river were some unattended stalls with snacks and toys. Few people were visiting, as you can see below. At first, I thought this would be a good education on the range of Indian landscape, but had a different lesson for us. As we walked up to the waters edge, I had a bit of a shock and pulled my family back in warning. Floating in the water, perhaps for days, was a dead man. Someone had covered his face with a newspaper. Our guides asked around and heard that the authorities had already been called. To our shock, no-one around us seemed disturbed. To our right, a family was performing a ceremony in which a son or brother releases their father/brother’s ashes into the river. Apparently, the dead body was too unremarkable or common to greatly affect anyone. They continued about their business, except to stay on the opposite side of the ghat. In addition to a comment about their familiarity with he circle of life and death, I wondered if it spoke to their sense of health concerns. Why was no-one too bothered about the health implications of bathing in a river with a dead body? In the end, I processed the moment as a chance for my family to see the wide range of India – its highs and lows. It may have contributed to their comments at the end of the trip that India contains the whole experience of human existence. Everything is shown at its fullest and purest – life, death, joy, sorrow, wealth, poverty, progress, history, beauty and ugliness. Hassan does not land on most foreign traveler’s itineraries. The temples aren’t the oldest or biggest. But if you’re looking to do more than scratch the surface of the South and you have the time, stop by and see a different side of the country… beside it’s on the way to the coffee plantations!! !